Today Bradley Wiggins won the 2012 Tour de France as the leader of a UK-based, Pro Tour cycling team. A British rider, Chris Froome, was second and Brits won seven stages (including three for Mark Cavendish). This is an astounding achievement. I wish my dad was here to see it. He put me on a bike in 1973 – the Merckx years. We both rode, in a different era, for Wiggins’ first club – the Archer Road Club. We would follow the Tour any way we could, even buying the Daily Telegraph to read Phil Ligget’s daily reports – the only way to get information within 24 hours. Dad would have been overjoyed to see a British rider leading a British team to victory. In 1980 I went on a coach package trip to France to see the finale of the Tour. Joop Zoetemelk won the race for the ‘British’ TI-Raleigh1 team and Irishman Sean Kelly was winning stages. Two British riders started: Paul Sherwen packed before the end but newcomer Graham Jones showed well before dropping back in the last week. He was there at the end for us to cheer on the Champs though. We thought that was a pretty good Tour for the Brits. The relative glory years of Tommy Simpson, Brian Robinson, Barry Hoban and Michael Wright were behind us but a new generation of riders were heading out to France and earning pro contracts2. In the next few years Scot Robert Millar would light up the mountain stages (and win the Polka Dot Jersey), Sean Yates, Chris Boardman and David Millar would emulate Simpson and wear the yellow jersey. I think that we thought that was about as good as it was possible to get. The ANC-Halfords 1987 Tour team had shown that the idea of a UK team competing at this level was unrealistic. The Irish, Americans and Australians, untrammelled by self-doubt, reinvented themselves as global cycling contenders while the Brits soldiered on bravely. There are a lot of well-informed and well-written newspaper articles around today (which, in itself, is an amazing change) that analyse what has changed since 1992, when Chris Boardman won Gold at the Barcelona Olympics. I have no great insights to add. I am just going to enjoy this amazing day. And raise a glass to my dad. Thanks, Brad and the team. 1 The sponsors were British but none of the Tour squad were. The manager, Peter Post, had a low opinion of British riders. 2 William Fotheringham’s book Roule Britannia is a great history of Brits competing in the Tour. I’ve just read On Tour by Bradley Wiggins with photos by Scott Mitchell. The book tells the story of Wiggins’ 2010 Tour de France riding for Team Sky. The race didn’t go as Wiggins hoped and he’s honest in his assessment of his performance. A lot of the text seems to be based on notes taken at the time and this rawness makes for great reading (I read it at a single sitting). There are some more reflective pieces on fellow riders and team helpers that are interesting as well. It’s fun trying to read between the lines. Wiggins is good at taking responsibility for his own performance, but there were obviously issues with how the team prepared for the race and how sometimes their famous seriousness and focus worked against the riders’ interests. I’m looking forward to seeing how (if) Team Sky 2.0 change their approach this year. It will be great to see Wiggins duke-ing it out with Schleck and co. in July. 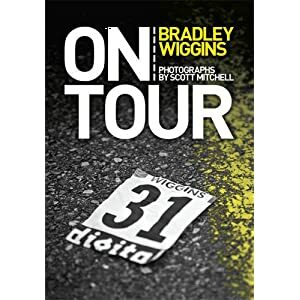 The black and white photographs by Scott Mitchell offer a great sidelight on Wiggins’ writing. I’m looking forward to going back to the book to look at them more carefully (you can see many of them here). Mitchell is not normally a cycling photographer – Wiggins approached him because he shared an interest in mod culture. He often has a different angle on classic cycling situations. There is a great new generation of cycling photographers coming through at the moment – it’d be great to see Mitchell being part of that. PS: The use of monochrome took me back to the photographs of my early days in cycling. The pictures of people like Bernard Thompson. Amazingly you can buy a CD of 100s of Thompson’s pictures from Rouleur – source of much of the new photography – here for only a tenner. >After missing Sunday’s race I thought I ought to get back to racing as soon as possible. After three days off the bike my wounds had healed and I was raring to go. An hour’s training in the morning suggested that I’d be able to stay in the saddle long enough. All of the races were run off in the pouring rain. The small field in the fourth cats and conservative pacing meant that the race was safer than usual. It was, however, uncomfortably wet. As expected, my lack of a change of pace has been exacerbated by an excess of time trials (this was my first circuit race since June 1st). I got dropped a couple of times but managed to get back on. With about five laps to go a gap opened that I couldn’t close, so I soloed in alone. A good workout though. Congratulations to team mate Tom who came second after a last lap solo break that saw him caught on the line. Race stats: Race distance: 17 miles, my time: 45:54 (22.5mph average speed). ? out of ?. Top speed: 31.0mph. Fastest mile: 2:22 (25.4mph – mile 13), slowest mile: 3:02 (19.8 mph – mile 1). Winner: ? >A warm weekend and a chance to enjoy some more relaxed cyclosport. As if I could relax! Saturday was Willesden CC’s circuit day at Hillingdon – several hours of fun racing. We rode (as I remember) a one lap TT, a team time trial, a GP des Gentlemen/Femmes and a ten lap handicap circuit race. I didn’t ride well and got really annoyed by that – which wasn’t at all in keeping with the spirit of the day. It was great to see over 40 racers and helpers of all ages there. Congratulations to champs for the day Jayne, Tom and Eliz. Thanks to Tony and Ray for organising it. Despite it being ‘all for fun’ I ended the day pretty tired, with several maximal efforts in the bank. Not the best preparation for Sunday’s West London Combine 50 mile TT organised by the Westerley CC. I was using this event to practice some drinking and feeding strategies for July 11th’s ‘100’. I knew the roads were hard and wasn’t too bothered about the time. Saturday’s efforts told straight away – heart rate down by 10+bpm. At about 25 miles I ran out of fuel and struggled to the finish (I would have packed if a) I didn’t need the miles and b) the Willesden CC crew weren’t marshalling the far roundabout for three hours in the hot sun). The poor road surface took it’s toll on my back and groin – the local highway authority ought to be ashamed of themselves – there are wheel breaking pot holes out there. My tri bars ended up at different angles because of the constant impacts. Only two riders caught me (team mates Peter (after 7 miles) and Stuart (after 49 miles) and I only caught one rider. A long, warm, uncomfortable day. Thank goodness it was an easy weekend. Final time 2:11:45, slowest of the WCC team. Race stats: Time: 2:11:45 (22.77mph). First 25 miles: 1:05:11, last 25 miles: 1:06:34. Top speed: 32.3mph. Slowest mile (28): 3:12 (18.75mph), fastest mile (6): 2:02 (29.51mph). Average HR: 149bpm, maximum HR: 158bpm. Average cadence: 74rpm. ? of ? finishers. 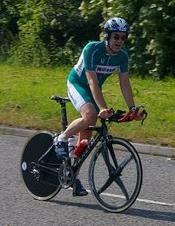 Winner: Peter Dixon (Willesden CC) 1:57:04. >After a couple of weeks away I returned to Hillingdon on Tuesday for the fourth category race. It had rained earlier in the day, so only about 13 riders lined up for the start. I was feeling rough and in an extremely negative frame of mind. Sure enough, after 5 miles I was shelled out and DNF’ed at the end of the lap. It was a shaming performance. Team mate Tom did well in 7th place, though he reckons a bit more savvy could have moved him up the order. Nothing ventured, nothing gained, Tom. I could have made some sort of amends by getting a decent training run in yesterday (Wednesday) but that didn’t happen either. I seem to be on a real mid-season dip. This is not good with my target ’50’ only ten days away. >They ran the race clockwise around the circuit tonight. I was concerned I wouldn’t be able to work out the lines through the turns complex. I needn’t have worried. I was dropped on the first lap. I’m not sure why it happened. I warmed up well and there were two neutralised laps to get the feel of the race. I actually got dropped on the tailwind descent! My legs felt okay at 80% effort, but there was nothing there when the pace picked up. My heart and lungs went into overdrive but the pistons were broken. A very disappointing DNF. It may be, with the schedule over the next few weeks, that an easy ride Tuesday morning is better for me than a Tuesday evening race.